Watercolor continues to challenge me, but I continue to practice. I’m a long way from being a watercolor artist. When I sat down to write this post I was going to share four watercolors with you, only one of which I like. Then I almost talked myself out of sharing the others, but in the spirit of sharing the good, the bad and the ugly, here are all four. I’m starting with the good one, so feel free to stop reading at any time. One of the challenges with watercolors, or at least my watercolors, is that they sometimes look good from a distance, but not so much up close. As a result, I always hate them when I’m doing them – but sometimes they grow on me when I walk away for a while. The process of scanning them and displaying them on a computer screen is also very unforgiving. Every flaw is glaring. 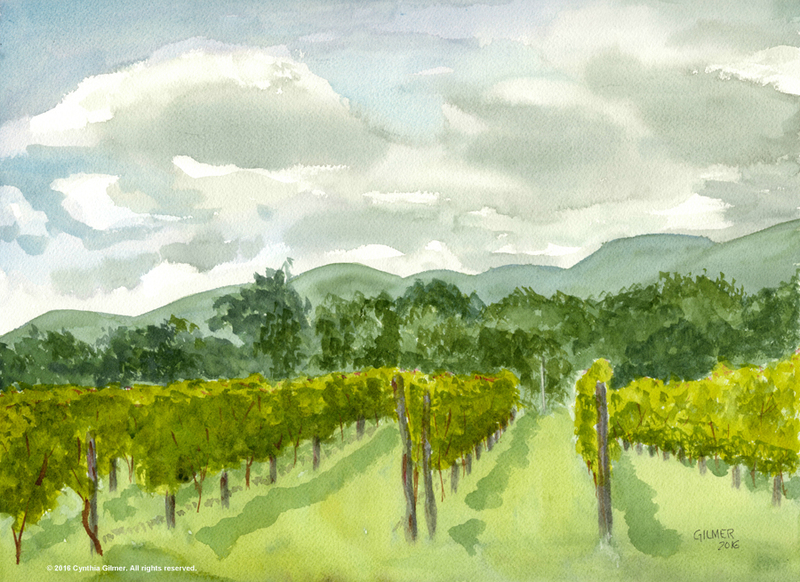 The first painting, and the best in my opinion, is of Afton Mountain Vineyards. I painted it from a photo I took on a pretty summer day. The sky was full of puffy clouds. My watercolor technique still needs a lot of work, but the finished painting has some appeal. I’m also really happy with the perspective on the rows of grape vines. I have thought about painting this photo many times, but have always been intimidated by getting the vines right. Now that I know I can do that I may try to do an oil version. It needs a barn or some other building though. We’ll see if I can get my engineer’s brain to paint something that’s not really there. The second painting is one I did in an afternoon, just as practice. This is definitely one that looks better with a little distance. 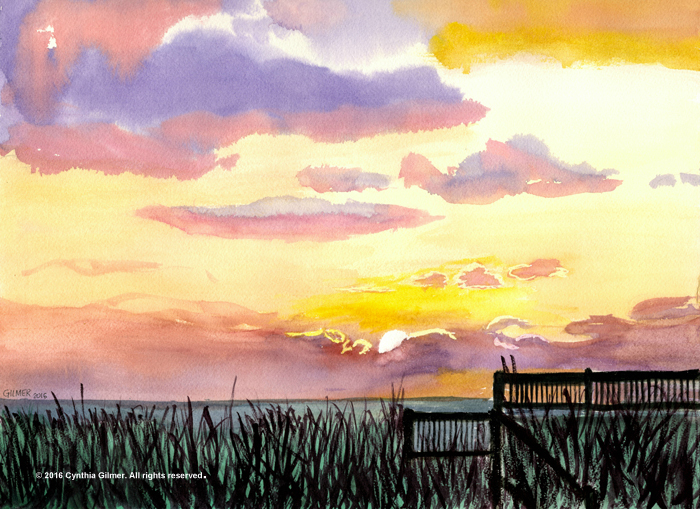 I was experimenting with masking fluid to keep the sun bright and also the reflection on the clouds near the sun. It worked pretty nice for the sun, but not so much for the clouds. The colors in the sky turned out pretty well. I’m still not crazy about the grass in the foreground. The next little ditty was done plein aire at Haines Chapel just off the Blue Ridge Parkway. For the most part I like this one. There’s a bit too much foreground. I could crop it. I also should have skipped the road, but my engineer’s brain wanted to put it in since it was there. The colors could be a bit bolder and brighter. I thought about doing some more washes on it in studio, but liked it enough as is that I decided not to mess with it. I have several ancestors buried in this cemetery (great-great grandparents and earlier), which makes it a special place for me. 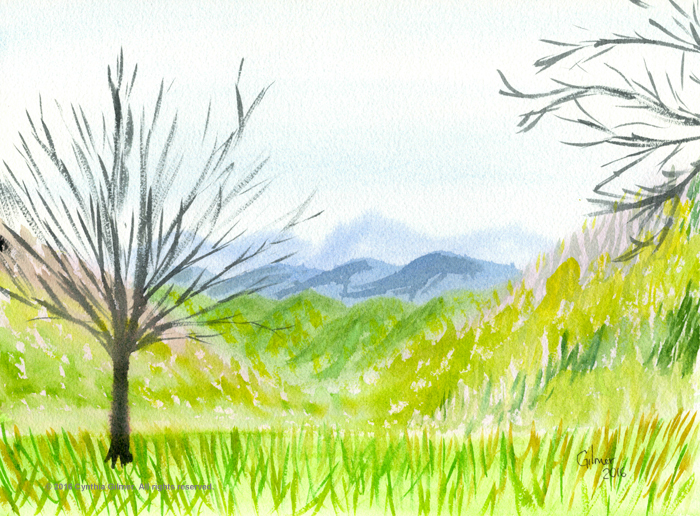 Finally, I did this watercolor from a photo of the Three Ridges overlook on the Blue Ridge Parkway. I had also done an oil painting of the scene plein aire but decided to play with watercolors. The greens are too vivid and I don’t like the brush strokes in the nearby mountains of the foreground grass. The wet-in-wet mountains are kind of cool and the distant mountains aren’t too bad. Still, I don’t really like this one, but I’m sharing the whole journey, so here it is. I’m signed up for the Falls Church Arts Plein Aire competition, and I was hoping to do some watercolors for that. Unfortunately, it’s been raining every weekend that I’ve stayed in Falls Church. Hopefully next weekend will be pretty, because it’s my last chance. 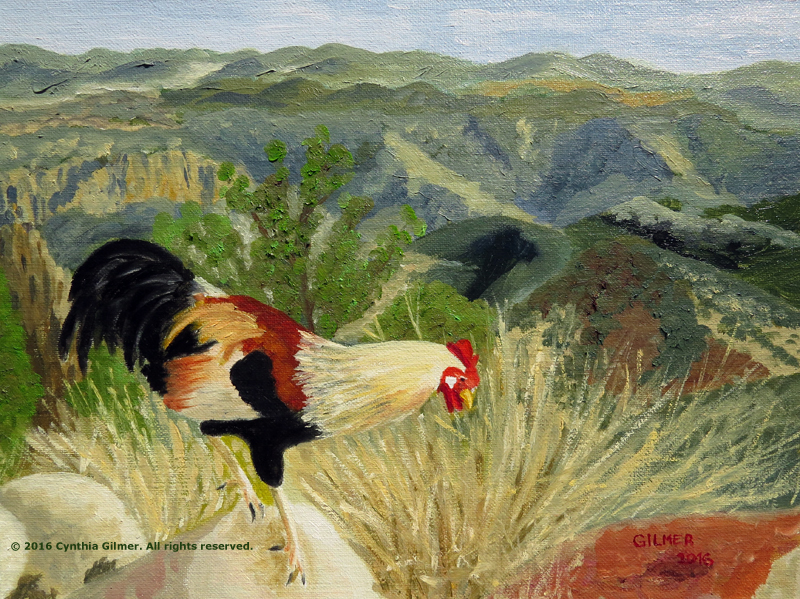 Just a quick follow up to let everyone know that my Pollo Mexicano painting was accepted into the Falls Church Arts Artful Whimsy. I’m thrilled to have been selected to be part of this curated show. The will be up in Art Space from May 11th through June 6th. See the Shows and Press page for the location.